When I was thinking of prompts, Favorite Book Covers came to mind. But then I started thinking about how we always complain about the worst of the DWJ covers and decided to put the Favorite Bad Covers twist on today's post! This one is the perfect combination of Mig and the wolf and just what I think Aunt Maria would look like but IT'S SO UGLY!! This looks like it's a novelization of V -- you know, the 80s show about the lizard aliens? -- but the collar looks just right. Also, there's no indication what the "three" could possibly mean except through the cheesy tag line. This is actually the newest cover, I think, and it's so silly and creepy that I love it. 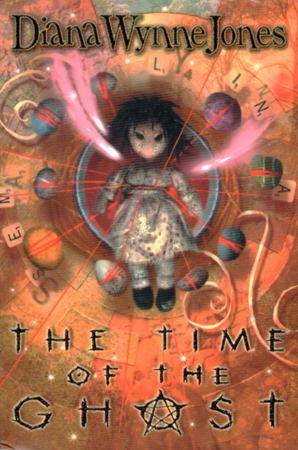 The title font is all satanic and the doll is just bizarre. 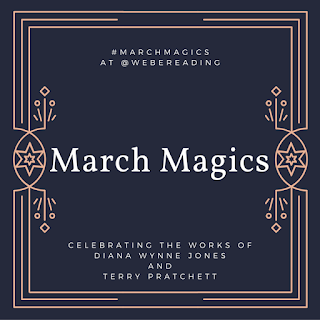 I decided not to go with any of the older Discworld covers because they are just plain bad. I'm trying to find newer covers for as many of those as possible! 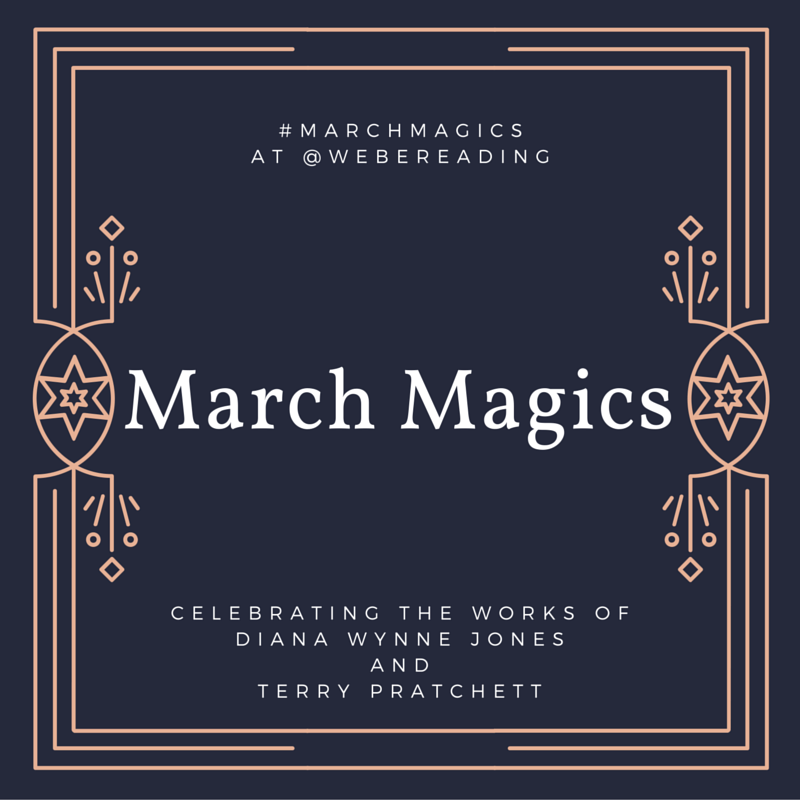 What are your favorite so-bad-they're-good DWJ or Pratchett covers? I have that Power of Three cover and I forgive it for having such a great collar. I've always presumed the person is supposed to be a Dorig, but he does look like a lizard alien instead. I love the Time of the Ghost cover! I can't understand what is going on but it's awesome. Is Monigan in a bowl of blood, tied down with red strings attached to rocks? Are the pink wings feathers, or ghostly Sally emanations? What? Haha, just three buddies, heading off toward a castle. Not really representative of the story! All of these freak me out so much I cannot even look at them. I have some others to share but it will be in a couple of weeks - I'm not playing by the rules this month. I actually have that Power of Three cover Jean references above - at least it doesn't make my eyes hurt, but it is pretty terrible in terms of representing the book. Where the heck did that castle come from? 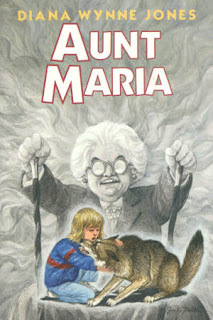 I have that cover for Aunt Maria! The Archer's Goon one from that same era is pretty bad too. 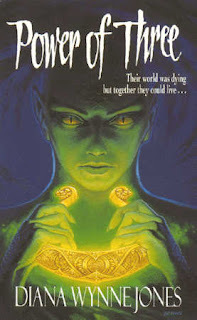 I don't think I've ever seen a good cover for Power of Three -- have you? I've seen some tolerable ones, but nothing I really liked. I reiterate my wish that the Conrad's Fate cover artist would illustrate a lovely matched set of Diana Wynne Jones's whole oeuvre. Wouldn't that be lovely? I'd buy them all. No. I have the Power of Three cover that's the weird creature eyes and it's creepy and bad. The newest one with just the collar isn't too bad except you can't really tell what it's supposed to be out of context. It looks like a golden horseshoe or something. A lovely matched set would be wonderful. Although, over time, I've grown attached to my mismatched jumble! The original cover of Dogsbody from the 1970s is pretty bad, but I still read it over and over -- I'll bet I'm the only one from my middle school who read it. 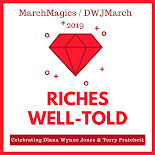 That's the thing that I worry about the most with the old and ugly DWJ and Pratchett covers. The kids just won't pick them up and they'll miss these amazing stories.